The inception of the First Nations Policing Program in 1992 led to the creation of 58 new First Nation Administered (FNA) police services: 20 of these agencies have subsequently disbanded. As these organizations had identical funding arrangements, served similar populations, and had been established under a common national policy framework, their experiences shed light on the factors that lead to disbanding. Ultimately, it was discovered that these organizations suffered from both a “liability of newness” and their diminutive size. Few of the disbanded agencies were operational for more than a decade and the average disbanded department employed five or less officers and provided services to communities of approximately 1,700 residents. Their annual budget was $0.7 million. In contrast, the 38 surviving FNA police services, on average, police approximately 4,500 residents by a detachment of about 22 officers with a policing budget of about $4.0 million. This finding confirms previous policing research, which posits that new and very small police services, usually deploying fewer than ten officers, are more apt to fail due to their inability to maintain or meet ever-increasing policing standards or deal with crises. Canada's First Nations Administered (FNA) police services have a unique history, a distinctive mandate and structure, and play a complex role in policing First Nation communities. They are also part of a larger Canadian policing environment – one that is evolving in ways that may have strong implications for FNA police services. Currently, Canadian policing is in a period of transition, due in a large part to a global process in the adoption of private-sector managerial and organizational values and strategies in the hope of producing greater fiscal accountability, cost efficiency, and value for money (Bayley and Shearing, 2001; Loader, 1999; CCA, 2014). These initiatives have resulted in an array of service models for policing in Canada, ranging from private and community policing to tiered public policing, as well as the amalgamation of small police services into larger regional police services. Of special interest is the challenge for provinces and territories of providing 24/7 coverage and ensuring adequate response times to calls for service for remote and isolated First Nation communities which, on average, have approximately 3,000 residents and are usually policed by micro-sized police detachments of about nine officers (Public Safety Canada, 2014). Research on police service life cycles has shown that small police services, usually deploying fewer than ten officers, are more apt to fail due to their inability to maintain or meet ever-increasing policing standards (King, 2009a). Policing remote or isolated places – also called limited-duration posts by some police services – poses numerous challenges for officers as the average rates of crime in Aboriginal communities are several times the national average (Brzozowski et al., 2006; Lithopoulos, 2013). With respect to the actual types of offenses in these places, Lithopoulos and Ruddell (2011) found that officers reported high rates of violence (including domestic or family violence), feuding between different groups and property crime. Rates of social disorganization reported by these officers were also high, and included high poverty and unemployment, inadequate housing, child welfare problems and substance abuse (Lithopoulos and Ruddell, 2011). Despite the high demands placed on them, officers believed that community residents had high expectations for the police. While representing a very small proportion of all Canadian officers and policing budgets, the manner in which First Nation communities are policed has profound long-term implications for the residents living there, especially given the high rates of crime and victimization in many of these places. For example, in 2004, the total on-reserve crime rate was about three times higher than rates in the rest of Canada, and rates of violence were up to eight times greater (Brzozowski, Taylor-Butts, & Johnson, 2006; Statistics Canada, 2011). As a result, the likelihood of victimization among Indigenous peoples (First Nation, Inuit, and Métis) was much larger than other Canadians (Perreault & Brennan, 2010; Statistics Canada, 2011). Last, although representing only about 4.3% of the national population, Canada's Indigenous peoples comprised 27% of admissions to provincial sentenced custody and 20% to federal custody (Dauvergne, 2012:11). It should be noted that our knowledge of Aboriginal crime rates is limited by the fact that most current Canadian government studies do not differentiate between Aboriginal and non-Aboriginal crime. In fact, most government publications that describe police-reported crime focus only on comparisons between offenses that occur in Census Metropolitan Areas (CMA) - cities of at least 100,000 residents where more than 50,000 live in an urban core - and non-CMA. As a result, when it comes to national-level statistics, we have to rely upon older scholarship comparing Aboriginal and non-Aboriginal crime rates (Brzozowski, Taylor-Butts and Johnson, 2006; Francisco and Chenier, 2007). Canada utilizes an indicator of crime called the Crime Severity Index (CSI), which is a measure of the total severity and volume of crime in a jurisdiction. The CSI is also calculated for violent and non-violent offenses (Boyce, Cotter, and Perreault, 2014). Newer scholarship concurs with the results of the earlier studies wherein the communities with the highest crime rates in Canada had a predominantly Aboriginal population. For example, in 2010, the national average Violent CSI (VCSI) was 88.9, but the three communities with the highest VCSI were Pelican Narrows (First Nation), Saskatchewan (1,382), Cape Dorset (Inuit), Nunavut (1,327), and Indian Brook (First Nation), Nova Scotia (1,126); all of these communities had fewer than 3,000 residents (Brennan, 2012). It is important to understand how organizational development and change in police services influences service delivery. King (2009a) posited that police services have a lifecycle and will pass through a series of events or turning points, including the agency's creation, founding, growth, decline, crisis, and disbanding. Each of these events shapes the organization, the activities of the employees, and relationships with agency stakeholders. This lifecycle approach provides a framework for examining the disbandment and survival of FNA police services in Canada. As with any newly founded organization, there are growing pains that policing organizations must confront, and FNA police services are no exception. Since the implementation of the First Nations Policing Program (FNPP) in 1992, 58 FNA police services have been created. Out of this number, 20 FNA have disbanded (see Table 1) representing a failure rate of about 34% of FNA police services (Public Safety Canada, 2014). Within this context, there is a research gap in this area and research is required to ascertain why some FNA police were disbanded and why some were able to survive. In what follows, there will be a brief overview of Canada's FNPP and then a description of the extant literature pertaining to why FNPP police services disbanded. Those sections are followed by a description of the data and methodology, which in turn are followed by the results of the analyses. Discussion and conclusion sections follow with an emphasis on implications for future research and policy development. The limitations of these policing arrangements were identified in 25 provincial and federal reports (Alberta Government, 1991) and this led to the introduction of the FNPP. The FNPP provided a national framework for the delivery of policing to Aboriginal communities—which are called First Nations for places once known as Indian reservations. 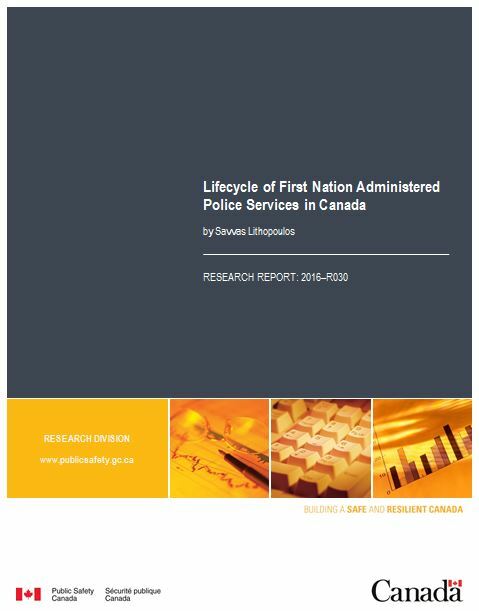 A cornerstone of the FNPP was that it enabled First Nations to establish their own police services, much like any other municipality in Canada, and these independent police services are labeled First Nations Administered (FNA) in this study. Alternatively, Aboriginal communities could contract with the RCMP, OPP, SQ or other regional agencies to provide police services if they preferred. The ability of Aboriginal peoples to found their own police agencies was seen as important for self-determination as they could now play a more significant role in the operations of their justice system, and provide a policing that was closer to their cultural traditions that would be delivered by Aboriginal officers. Regardless of whether the community chose to form its own police department, or contract with other larger police services, 100% of the policing costs were covered by the federal (52%) and provincial (48%) governments. While the FNPP provided a national framework for policing Aboriginal communities, these agencies were still required to abide by provincial policing standards—and those standards were identical to any other municipal police service. To establish these policing arrangements, the community leaders would engage into tripartite agreements with the federal and provincial governments. Between 1992 and 1996, 46 FNA police services were established. There is little publicly available evidence-based research on the disbandment of police services in Canada. Johal (2001) is the only Canadian study that examined the disbandment of two FNA police services in the province of British Columbia (B.C.). However, in Canada, public institutions, including police services, do not last forever. Over the last 40 years numerous small and medium-sized police services have been disbanded and amalgamated into larger regional police services (McDavid, 2002; Lithopoulos & Rigakos, 2005; Lithopoulos, 2015). The trend toward the consolidation of smaller police services into larger regional police services in Canada is similar to what is occurring in the United States (King, 2009a) and the United Kingdom (Rogers and Gravelle, 2012). In Quebec, the provincial government amended the Quebec Police Act (2000) wherein municipalities with populations less than 50,000 had to contract for policing with the SQ. The rest of municipal police services that were unable to meet the new provincial policing standards were disbanded and consolidated into larger ones. Since 2001, the number of municipal police services in Quebec has shrunk from about 109 to 30 as of November 15, 2012 (Sécurité publique Québec, 2014). This represents a 72% reduction in the number of municipal police services in Quebec over a 10-year period. In Ontario, from 1962 to 1996, 153 police services were amalgamated by the provincial government into 11 regional police services providing policing to over 60 per cent of Ontario's population (Lithopoulos, 1988; CCJS, 1998). The regionalization trend was accelerated in the 1990s when the provincial government enacted Bill 105 (Police Services Amendment Act, 1997), introducing “equitable police financing” to the province. The OPP was dramatically affected as they saw their service contracts to municipalities increase exponentially. The OPP had 16 police service contracts in 1988 (Lithopoulos, 1988), but by 2014, that number had risen to 145 contracts with full cost recovery (OPP, 2014). 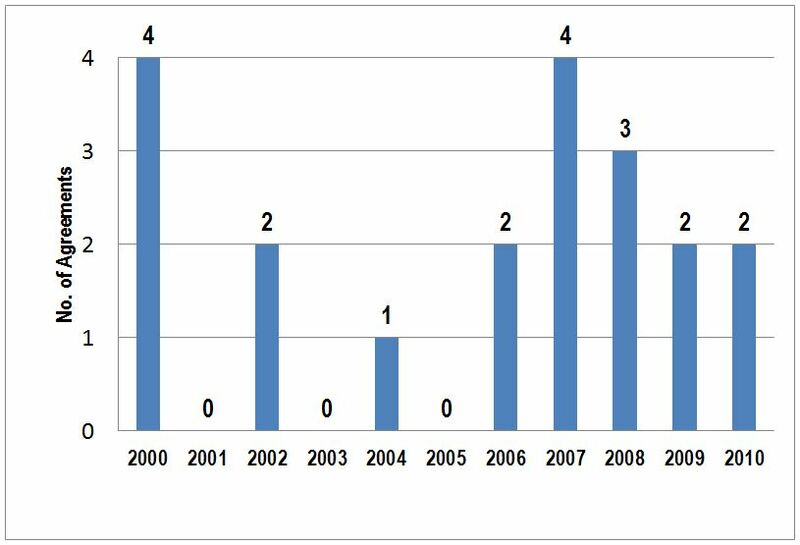 Following the major municipal restructuring that took place after Bill 105, the OPP managed to cut the number of non-contract municipalities it policed from 576 in 1998 to 179 by 2014 (CCJS, 1998: OPP, 2014). King (2009b) suggests that police organizations are particularly vulnerable during their founding years to disbanding, and it is plausible that the failure of these FNA police services is consistent with what has occurred in other jurisdictions. As King (2009b:1) noted, “Overall, police services disband because they cannot adapt to changes in their contingency and institutional environments or they change in inappropriate ways, and their small organizational size does not provide a sufficient buffer against external intrusion from the institutional environment.” Brunet (2014:6-7) further posits that there is a positive relationship between police service size and survival as small police organizations are “less able to marshal the political support necessary for survival.” In addition, the newer organizations tend to fail more often than old and “the survival of an organization is positively related to its age” and that new organizations suffer from a “liability of newness” (Brunet, 2014:7). This may be related to a low level of institutional legitimacy, credibility and political capital which would enable them to survive operational and political crises compared to older and well-established police services. Apart from a review of the extant literature on the lifecycle of police services and Indigenous policing in Canada, there was also a review of FNPP policy documents, Aboriginal Tripartite Policing agreements, police service audits, and internal reports to ascertain the original aims and objectives of these agreements and why they were disbanded. To develop the appropriate criteria for this study, an analysis of these documents was required to identify any discrepancy between the initial core objectives of the tripartite policing agreements and the actual operations of the First Nation police services. The police administration data utilized were derived from the Aboriginal Policing Information Management System (APIMS) which is maintained by Public Safety Canada covering the period from 2000 to 2015. This database consists of data collected and inputted by FNPP program staff. The APIMS is the primary instrument for the collection of national Indigenous policing statistics on personnel, federal and provincial expenditures, police infrastructure and on-reserve socio-demographic and geographic characteristics. The FNPP regional managers (who are responsible for the negotiation and implementation of the tripartite policing agreements on behalf of the federal government) were also interviewed to ascertain their interpretations on why the FNA police services were disbanded in their respective region (see Table 1). The statistical test of significance utilized in this study was analysis of variance (ANOVA), which tests the hypothesis that the group means of the dependent variable are equal. The dependent variable is the interval-level, and one or more categorical variables define the groups (i.e. current vs. disbanded First Nation police services). There were significant information gaps and inconsistencies on what was recorded concerning the disbandment of FNA police services files. Chronologically, it was difficult to follow the life course of FNA police services by solely using this source of information. Interviews with current FNPP regional staff also revealed that they often could not recall why some FNAs were disbanded as they were not working in the program at the time of the disbandment. Many of the actors that were involved in the disbandment were no longer working for the program, or had left government employment. Another limitation of this study was the lack of criminal justice data (used as standard police performance metrics) for the disbanded FNA police services. The majority did not submit their Uniform Crime Report (UCR) data to Statistics Canada. Even the current FNAs and the RCMP Community Tripartite Agreement detachments are inconsistent in the submission of their First Nation communities UCR data. Due to the large data gaps, a comparison of crime rates between the current and the disbanded FNA police services could not be made. Based on King (2009a; 2009b), Ruddell et. al. (2014) and Brunet's (2014) research efforts, the following six indicators were used to compare outcomes of current (2015) and disbanded FNA police services: 1) duration of agreement (years); 2) population policed; 3) number of communities covered; 4) community remoteness; 5) number of officers; and 6) agreement cost. Other relevant measures such as comparing community well-being and crime rates between current and disbanded FNA police services is a difficult task given the lack of available data. This shortcoming is compounded by a lack of publicly available evidence-based research on the disbandment of police services in Canada. Ideally, the inclusion of surveys on citizen satisfaction with FNA policing that allows comparisons between current and disbanded FNA police services would be beneficial, but this would be a costly endeavour that is outside the scope of this paper. Therefore, it must be emphasized that the six indicators chosen for the analysis represent only a piece of the puzzle on police agency lifecycle. At the risk of repeating a standard police research cliché: more research needs to be undertaken to develop a more comprehensive model for measuring the lifecycle of police agencies. In the meantime, however, the available measures can be gleaned from existing data sources to commence the building of an empirical model of police agency lifecycle. This study is a comparative analysis of all 20 disbanded and all 38 current First Nations Administered (FNA) police service agreements funded under the First Nations Policing Program (FNPP) in Canada (see Table 1 below). The majority of the disbanded FNA police services were located in Quebec (9) and Alberta (7) respectively representing 80% of all the disbanded FNAs. Currently, Quebec and Ontario contain about 82% (31) of the current FNA police service agreements in the country. Alberta has four FNA agreements with Manitoba, Saskatchewan and British Columbia having one each. Since the inception of the FNPP in 1992, there have been, in total, 58 FNA policing agreements, and out of these, 38 police services (66%) are still operating and 20 (34%) that have been disbanded. The 58 FNA policing agreements analyzed provided policing services to 209 First Nation communities comprising 205,534 inhabitants. The 38 current FNAs police services provide services to 176 First Nation communities comprised of 171,681 inhabitants, and the disbanded FNA police services provided policing to 33 First Nation communities comprised of 33,853 inhabitants. An average, current FNA policing agreement comprises of 22 officers serving five First Nation communities with approximately 4,500 inhabitants with an annual budget of $4 million. Disbanded FNAs, on the other hand, on average, were comprised of only five officers serving two communities with approximately 1,700 inhabitants with an average annual budget of $0.7 million. In terms of total population, 84% of the sample is policed by the current FNA police services and 16% was policed by the disbanded police services. Similarly, 89% of the officers work for the current FNAs services versus 11% who had worked for the disbanded services. As Table 2 illustrates, in 2014 dollars, current FNA police services represent 91% of FNPP policing expenditures and with the remainder 9% by the disbanded police services. Since the inception of the FNPP, the Program has been implemented across Canada through tripartite agreements negotiated among the federal government, provincial or territorial governments and First Nations, to provide police services that are effective, professional and tailored to meet the needs of each community. These agreements provide that the federal government pays 52 percent and the provincial government 48 percent of the government's contribution toward the cost of First Nation policing services. The termination of FNPP policing agreements are usually for serious violations of agreement terms and conditions, as well as major operational and ethical breeches, or inability to meet increasing provincial policing standards. Both levels of government are usually involved in the decision to disband an FNA police service. However, as local policing falls under provincial jurisdiction, the provincial governments also have the legal authority to unilaterally disband a police service within their province, if it does not meet provincial policing standards. All of the closures of FNA police services occurred over an 11-year period from 2000 to 2010. The majority of these police services 13 (65%) were closed in the five-year period from 2006 to 2010. The first indicator developed to measure the differences between current versus disbanded FNA police services is the duration of the tripartite agreement, or the number of years an average agreement has been or was in existence. This is important from a planning perspective, as it provides a good overview on what should be the appropriate risk-mitigation timelines when implementing and developing new police services. As Table 4 illustrates, the current FNAs are more durable as the average time they have been in existence is 19.3 years versus only 9.2 years for the disbanded FNAs. This represents a 123% difference between the two groups. The differences were statistically significant (ANOVA, F = 39.195, p < 0.0001). This finding supports King's (2009b) and Brunet's (2014) assertion that police organizations are particularly vulnerable during their founding years to disbanding. A major factor that both King (200b) and Brunet (2014) did not take into account the fact that young organizations also tend to have younger and inexperienced police officers, non-commissioned officers, senior management, and police governance authorities. In their landmark survey of Aboriginal police officers, Murphy and Clairmont (1996) discovered that while police personnel in the First Nations communities were shown to be quite comparable to their counterparts elsewhere in Canada in terms of basic socio-demographic characteristics (e.g., gender, marital status), education, training, philosophy of policing, evaluation of their policing organization, assessment of police work, time spent on the various police functions, job satisfaction and major areas of reported stress. However, they differed with respect to age and experience in policing (being less in both), having to confront some special circumstances such as 'political pressures,' being with new organizations having start-up problems, and dealing with very high violent crime rates and workloads. All these factors may overwhelm young and inexperienced police officers. The second indicator developed for this study was average number of inhabitants for whom the current and disbanded FNA police services are providing policing services. This is an important indicator as the detachment police complement level under the FNPP depends largely on the number of inhabitants policed. The average number of inhabitants the current FNAs police is 4,509 versus 1,693 for the disbanded police services. This represents a 166% difference between the two groups with the differences being statistically significant (ANOVA, F =5.339, p < 0.025) (Table 4). This finding underlines the challenge of providing 24/7 coverage and ensuring adequate response times to calls for service for low population communities which are often located in remote and isolated locations, as well as recruiting and retaining qualified police officers from a relatively low population base (Lithopoulos and Ruddell, 2011; Lithopoulos and Ruddell, 2013; Public Safety Canada, 2014). The third indicator developed for this study was the average number of First Nations (communities) that the current and disbanded FNA police services are providing policing services. The average number of communities the current FNAs police is 4.6 versus 1.7 for the disbanded police services representing a 171% difference between the two groups. This difference was not statistically significant, although it was very close (ANOVA, F =3.119, p < 0.083) (Table 4). This finding underscores the fact that what is more significant in First Nation policing is the total size of the population being policed rather than the number of communities policed, which may be linked to the aggregate level of human capital available and community capacity and ability to support an FNA police service (White and Maxim, 2007). This refers to the geographic zone the Aboriginal community is located and based on the number of kilometers a community is from the nearest urban center as calculated by Aboriginal Affairs and Northern Development Canada (AANDC). Basically, AANDC categorizes the Aboriginal communities into four geographic zones with 1 being the closest to an urban center and 4 being a remote community that can only be accessed by boat or air (see Table 3 below). The 209 communities considered in this study (policed under current and disbanded FNAs) were classified into four different geographic zones (geozones) that defined their respective geographical isolation (see Ruddell, Lithopoulos and Jones, 2014). These geozones were based on the distance from urban areas and accessibility (e.g. whether they were communities that had no year-round road access). Table 3 presents the definitions of the four different geozones. The community is located within 50 kilometers (30 miles) of the nearest urban area with year-round road access (n = 20). The community is located within 50 and 350 kilometers (30 to 217 miles) of the nearest urban area with year-round road access (n = 24). The community is located over 350 kilometers (217 miles) from the nearest urban area with year-round road access (n = 4). The community has no year-round road access to an urban area (could have 'winter' roads, or access in the summer by water, or accessible only by aircraft) (n = 10). Testing for geographic isolation by community it was discovered that there was no significant statistical significance (ANOVA, F = 0.571, p < 0.453) between community remoteness and FNA disbandment (Table 4). In terms of the socio-demographic variables, it appears that population size is more significant than community remoteness. The fifth indicator developed to measure the differences between current versus disbanded FNA police services is the number of police officer per tripartite agreement, or the average number of police officers per agreement (for the disbanded services it was the number of officers during the last year of its existence). Testing for this indicator was important to address King's (2009a, 2009b)) assertion that very small police services fewer than 10 officers tend to fail. Within this context, as Table 4 illustrates, the current FNAs have substantially more officers per agreement with average being 22.1 versus on only 5.2 officers for the disbanded police services. This represents a substantial 325% difference between the two groups. The differences were statistically significant (ANOVA, F = 7.125, p < 0.01). Therefore, the finding supports King's (2009a, 2009b) and Brunet's (2014) assertion that police organizations deploying fewer than 10 officers are more apt to fail due to their inability to maintain or meet ever-increasing policing standards, or to adequately deal with crises. The sixth indicator developed to measure the differences between current versus disbanded FNA police services is total cost of the average tripartite agreement in 2014 dollars as this is an indicator of police service size and available resources. As Table 4 illustrates, the current FNAs have substantially higher expenditures per agreement with the average being about $4 million versus only $700 thousand for the disbanded police services. This represents a substantial 432% difference between the two groups with differences being statistically significant (ANOVA, F = 6.545, p < 0.01). This is not surprising considering that current FNA agreements provide police services to a significantly higher population base, which, naturally, requires substantially more officers and higher agreement costs. All these factors are highly correlated. From its inception, the FNPP was viewed as a practical way to ensure that First Nation communities would be provided with culturally appropriate policing, while at the same time, the communities would receive policing services that were equal in quality to policing services that were being provided to non-First Nation communities in Canada. All this was going to be achieved through the establishment of tripartite policing agreements that would be undertaken in a planned and coordinated manner and that the implementation of these new policing agreements should provide for a phasing-in period to ensure the likelihood of success (DIAND, 1990; Solicitor General, 1992; Solicitor General, 1996). In the early years of the FNPP, the federal government's role in the development of new FNA police services was primarily that of a funding nature. Expert advice, direction and control implementation were left to provincial and First Nation officials, who, in some cases, underestimated the difficulties in establishing new policing arrangements (Navigant Consulting, 2008). In some cases there was a failure to develop comprehensive and realistic implementation plans that provided for sufficient time for police officer and infrastructure development (Cardinal, 1998; 2013; Public Safety Canada, 2010; Lithopoulos and Ruddell, 2013). Concurrently, there was pressure to quickly conclude tripartite policing agreements that may have led, initially, to the deterioration of public safety and security in some First Nation communities. For example, from 1992 to 1995, 46 tripartite agreements were signed employing more than 800 First Nation officers that, unfortunately, may have led to the creation of a few FNA police services that were not as effective, efficient, or professional as the police services they replaced (Cardinal, 1998; Lithopoulos and Ruddell, 2013). However, it must be emphasized that in the majority of policing agreements the recipients were undertaking activities consistent with the stated objectives on the contribution agreements. In addition, in most cases, recipients were complying with the financial and non-financial terms of the tripartite agreements. The concept of police independence is one of the critical components of professional and effective policing in Canada that is reflected in the FNPP policy principle stipulating that First Nation Police Governing Authorities (PGA) would be established with any new FNA policing agreement to ensure police independence from inappropriate partisan and political influences (Solicitor General, 1996:5). The principle embodies the central idea that the exercise of the “quasi-judicial” powers of the police (i.e. laying of information, arrest, detention, and search and seizure) is provided by statute (Criminal Code, 1985), and, therefore, should be independent from inappropriate partisan influences. However, not unlike non-First Nations communities, there have been instances where FNA police services have been subject to inappropriate political influences (Cardinal, 1998; Johal, 2001; Navigant Consulting, 2008). Ontario poses a special challenge to the FNPP policy principles on police governance and accountability as FNA police services and officers are not subject to the general accountability, regulatory regime, or level of policing standards demanded of non-First Nation police services (Police Services Act, 1990). This has had potentially negative ramifications in such areas as the impartial review of citizen complaints and redress for First Nation officers subject to discipline or dismissal proceedings. To rectify this weakness, it has been attempted to deal with this through tripartite policing agreements that provide mechanisms of impartial and independent review of allegations of police misconduct. However, the wording varies from agreement to agreement which does not have the same legal stature and consistency of application as provincial policing legislation. In general, First Nation PGAs tend to lack the statutory authority and protection to deal successfully with political influence, and provide effective policing governance to ensure appropriate policing standards and policies are established and maintained. In theory, PGAs should represent the interests of the community and act as liaison between the police service and the local band council. In reality, however, Johal (2001:107) discovered that “communication was sometime hindered because many individuals belonged to both the local band council and the PGA,” which can result in the legitimacy and credibility of the PGA to be questioned. This issue is often associated with a lack of community capacity due to a low population base. Frequently, in small First Nation communities the same individuals occupy multiple roles as there are not enough qualified candidates to fill all the required leadership positions in these communities. In other words, the talent pool is shallow. This is a serious problem for small and remote First Nation communities throughout Canada. The third factor for the termination of FNA policing agreements concerns the above-mentioned role confusion between PGA and band council responsibilities. On several occasions it led to poor political decision-making by First Nation governments, which contributed to the termination of agreements for major breaches of their terms and conditions. For example, in Alberta, the Louis Bull tripartite agreement (which had recently amalgamated with the Siksika and Hobbema police services in the mid-2000s) was terminated after the band council legally incorporated the police service to Louis Bull Inc. Both levels of government, therefore, were forced to terminate funding for the police service as this move violated the terms and conditions of the agreement as the incorporated police service was not the legal entity in the agreement (Simons, 2008). As a senior police official who at the time worked in the disbanded police service told the writer, “the amalgamation [of the police services] succeeded, but it was political issues that were the problem.” This illustrates the vulnerability of micro-sized police services to political forces which, often, can be beyond their meagre capabilities to deal with effectively. Thomson, Clairmont and Clairmont (2003) observed that prior to entering into municipal agreements with the RCMP, small-town police services in Nova Scotia were characterized by political interference, a lack of professionally trained officers, inexperienced leaders, and their stand-alone orientation was both expensive and inefficient. It was likely that this was the norm throughout Canada and the enactment of legislation that mandated more professional police services contributed to the death of many of these small-town services. Smaller communities now benefit from better trained and more professional officers at a lower cost. Police services also benefited as it was easier to recruit officers to work in these out-of-the-way locations if they knew that working in a geographically remote detachment was only a step in a longer policing career. By contrast, officers in smaller, FNA police services might be permanently posted to remote communities, and this might make it more difficult to recruit and retain officers in those police services (Jones, et al., 2013). Turnover in these smaller operations can be very high as some new police officers may accept a job in these services, and then transfer to a larger police service after they have developed their knowledge and skills on the job. One example of a mass turnover occurred at the Kativik Regional Police Force (an agency serving rural Quebec), that lost 30 of their 66 officers between January 1 and May 30, 2013 (George, 2013). As a result of high levels of officer turnover, some small agencies are caught in a cycle of recruiting, training, and mentoring that is expensive and disruptive as the resources and creativity of the agency is spent on ensuring a full complement of officers rather than crime reduction activities or responding to the community's needs. The inception of the FNPP in 1992 led to the creation of 58 new First Nation Administered police services: 20 of these agencies have subsequently disbanded. As these organizations had identical funding arrangements, served similar populations, and established under a common national policy framework their experiences shed light on the factors that lead to disbanding. Ultimately, it was discovered that these disbanded organizations suffered from both a “liability of newness” and their diminutive size. Few of the disbanded agencies were operational for more than a decade and the average disbanded department employed five or less officers and provided services to communities of approximately 1,700 residents. Their average budget was $0.7 million. In contrast, the 38 surviving FNA police services, on average, police approximately 4,500 residents by a detachment of about 22 officers with a policing budget of about $4.0 million. This finding confirms previous policing research, which posits that new and very small police services, usually deploying fewer than ten officers, are more apt to fail due to their inability to maintain or meet ever-increasing policing standards or deal with crises. Previous research has shown that police services have a lifecycle and will pass through a series of events or turning points, including their creation, founding, growth, decline, crisis, and disbanding. Each of these events shapes the organization, the activities of the employees, and relationships with police stakeholders. This approach provided the theoretical framework for the examination of the disbandment of the 20 FNA police services from 2000 to 2010. A major factor that previous research on the lifecycle of police services did not take into account is the fact that young organizations also tend to have younger and inexperienced police officers, non-commissioned officers, senior management, and police governance authorities. Only four years after the inception of the FNPP, in their landmark survey of Aboriginal police officers, Murphy and Clairmont (1996) discovered that while police personnel in the First Nations communities were shown to be quite comparable to their counterparts elsewhere in Canada in terms of basic socio-demographic characteristics (e.g., gender, marital status), education, training, philosophy of policing, evaluation of their policing organization, assessment of police work, time spent on the various police functions, job satisfaction and major areas of reported stress. However, they differed with respect to age and experience in policing (being less in both), having to confront some special circumstances such as 'political pressures,' being with new organizations having start-up problems, and dealing with very high violent crime rates and workloads. The combination of all these factors may have been an overwhelming experience for many of these young and inexperienced police officers. These problems were compounded by the failure of policy-makers to be cognizant of the major long-term trend in Canadian policing which was the amalgamation of small police services into larger police services since the 1970s (McDavid, 2002; Lithopoulos & Rigakos, 2005; Lithopoulos, 2015). Recent research into this area (Southwick, 2005; Found, 2012; Lithopoulos, 2015) indicates that the amalgamation of micro-sized police services into larger medium sized regional entities may be a valid strategy for the future direction of Aboriginal and non-Aboriginal policing in Canada. Alberta Government (1991), Justice on trial. Available at: http://justice.alberta.ca/programs_services/aboriginal/Publications%20Library%20%20Aboriginal%20Justice/CawseyReportVolumeI.aspx/DispForm.aspx?ID=15 (Accessed 15 June 2014). Allen, M. & Perreault, S. (2015). Police-reported crime in Canada's provincial North and territories, 2013. Ottawa, ON: Canadian Centre for Justice Statistics. Bayley, D. and Shearing, C.D. (2001). The New Structure of Policing: Description, Conceptualization, and Research Agenda. National Institute of Justice, Washington, DC. Brennan, S. (2012). Police-reported crime statistics in Canada, 2011. Ottawa, CAN: Canadian Centre for Justice Statistics. Brunet, J. R. (2014). Goodbye Mayberry: The Curious Demise of Rural Police Departments in North Carolina. Administration & Society, 0095399714540155. Brzozowski, J., Taylor-Butts, A., and Johnson, S. (2006). Victimization and Offending Among the Aboriginal Population in Canada. Canadian Centre for Justice Statistics, Ottawa, CAN. CCA (2014). Policing Canada in the 21ST Century: New Policing for New Challenges: The Expert Panel on the Future of Canadian Policing Models. Ottawa: The Council of Canadian Academies. CCJS (1998). Police Personnel and Resources in Canada – 1997 and 1998. Canadian Center for Justice Statistics, Statistics Canada, Ottawa, No. 85F0019. Criminal Code, R.S.C. 1985, c.46, s.231(6). DIAND (January 1990). Indian Policing Policy Review: Task Force Report. Ottawa: Department of Indian Affairs and Northern Development. Dauvergne, M. (2012). Adult Correctional Statistics in Canada, 2010/2011. Ottawa, CAN: Canadian Centre for Justice Statistics. Found, A. (2012). Economies of Scale in Fire and Police Services in Ontario. University of Toronto: Institute on Municipal Finance & Governance. Francisco, J., and Chenier, C. (2007). A comparison of large urban, small urban and rural crime rates. Ottawa, ON: Canadian Centre for Justice Statistics. George, J. (2013). Beleaguered Nunavik police force trudges on: Kativik Regional Police Force rebuilds after losing more than 30 members, Nunatsiaq Online, May 30, 2013, Available at:http://www.nunatsiaqonline.ca/stories/article/65674beleaguered_nunavik_police_force_trudges_ahead/ (Accessed 15 June 2014). Johal, S. (2001). First Nations Self-Administered Police Forces: The Changing Nature of the Administration of Justice. University of British, thesis submitted in partial fulfilment of the requirements for the degree of Master of Arts in the Department of Political Science. Jones, N. A., Ruddell, R., Nestor, R., Quinn, K. and Phillips, B. (2013). First Nations Policing – A Review of the Literature. Collaborative Centre for Justice & Safety, Regina, CAN. King, W. R. (2009a). Toward a Life Course Perspective of Police Organizations. Journal of Research in Crime and Delinquency, 46, 213-244. Linden, S. B. (2007). Report of the Ipperwash Inquiry. Toronto, Ontario: Government of Ontario. Lithopoulos, S. (1988). Police Personnel in Canada, 1988. Juristat Service Bulletin, Vol. 9 No. 3, Canadian Center for Justice Statistics, Statistics Canada (August 1989). Lithopoulos, S. and Rigakos, G. (2005). Neo-liberalism, community, and police regionalization in Canada. A critical empirical analysis. Policing: An International Journal of Police Strategies & Management, Vol. 28 No. 2, pp. 337-352. Lithopoulos, S., and Ruddell, R. (2011). Policing isolated Aboriginal communities: perspectives of Canadian officers. Policing: An International Journal of Police Strategies and Management, Vol. 34, No. 3, pp. 434-453. Lithopoulos, S. (2013). First Nations Policing Policy/Program (FNPP) update, presentation, University Regina, Regina, October 16. Lithopoulos, S. and Ruddell, R. (December 2013). Aboriginal policing in Rural Canada: Establishing a Research Agenda. International Journal of Rural Criminology. Volume 2, Issue 1, pp. 3. Lithopoulos, S. (2015). A Literature Review on the Amalgamation of Police Services in Canada. Ottawa, Ontario: Public Safety Canada. Cat. No. PS114-16/2015E-PDF, ISBN: 978-0-660-23313-0. Loader, I. (1999). Private security and the demand for protection in contemporary Britain. Sociology, Vol. 33 No. 2, pp. 373-92. McDavid, J. C. (2002). The impacts of amalgamation on police services in the Halifax Regional Municipality. Canadian Public Administration, 45(4), pp. 538-565. Murphy, C., & Clairmont, D. H. (1996). First Nations Police Officers Survey. Solicitor General Canada, Ministry Secretariat. Navigant Consulting (2008). Report on the Forensic Audit of Funding Under Contribution Agreements with the Mohawk Council of Kanesatake during the Period April 1, 2003 to March 31, 2005. Ottawa: Public Safety Canada. OPP (2014). Frequently Asked Questions, available at: http://www.opp.ca/ecms/files/278205776.6.pdf (accessed on July 29, 2014). Public Safety Canada (2010), 2009-2010 Evaluation of the First Nations Policing Program, Author, Ottawa, CAN. Public Safety Canada (2014). Aboriginal policing data provided by the First Nations Policing Program, Public Safety Canada, as of December 31, 2014. Rogers, C., & Gravelle, J. (2012). Future of policing in the UK: Understanding the economics. Review of European Studies, 5(1), 116-123. Ruddell, R., Lithopoulos, S. and Jones, N. (2014). Crime, costs, and well-being: policing Canadian Aboriginal communities. Policing: An International Journal of Police Strategies & Management. Vol. 37 Issue: 4, pp.779 – 793. Solicitor General (1992). First Nations Policing Policy. Ottawa: Solicitor General Canada. Solicitor General (1996). First Nations Policing Policy. Ottawa: Solicitor General Canada. Southwick, L. (2005). Economies of scale and market power in policing. Managerial and Decision Economics, Vol. 26, Issue 8, pp. 461-473. Statistics Canada (2011). Violent Victimization of Aboriginal People in the Canadian Provinces, 2009. (Catalogue No. 85-002-X) Ottawa: Author. Thomson, A., and Clairmont, D. (2013). Canada: The Annapolis Valley. In M. K. Nalla and G. R. Newman (Eds. ), Community policing in Indigenous communities (pp. 91–98). Boca Raton, FL: CRC Press. White, J.P. and Maxim, P.S. (2007), Community Well-Being: A Comparable Communities Analysis. Ottawa: Aboriginal Affairs and Northern Development Canada. Available at: www.ainc-inac.gc.ca/ai/rs/pubs/re/cca/cca-eng.pdf (accessed June 15, 2014).